These look mega and are dead simple to make. Get your mates to be sous chefs and help with shaping the patties, cutting out the burger buns and doing the ‘stack’. If you fancy making standard size burgers this quantity would make 4 burgers but will take longer to cook. Using one hand, slap the mince into a bowl with the chopped onion, barbecue sauce, breadcrumbs, egg and garlic. Mix well using your hands or a fork and shape beef mixture into 24 patties (using slightly wet hands makes this job a cinch). Put the patties onto a tray, cover and chill out in the fridge for 5 minutes, whilst you prepare the burgers. Preheat the grill. Slice the buns horizontally and using a 4cm round cutter, cut rounds from each bun half, place on baking trays. Toast buns cut side up under a hot grill until browned lightly. Put any leftover crusts in a bag and into the freezer, great for breadcrumbs or give the birds in the garden a treat! Heat a large frying pan, brush the burgers with a little oil. Cook for 3 minutes on each side. Combine the tomato ketchup with the mustard in a small bowl; divide mixture evenly onto the bases. 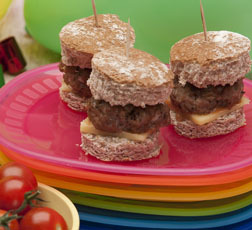 Cut the cheese into small slices, top each bun base with a hot patty, cheese then bun on top. Use a cocktail stick to secure the stack and serve. To freeze ahead:Complete the recipe up to the end of step 4. Cool and pack into an airtight container. Freeze for up to 3 months. To use: Put the patties onto a baking tray from frozen and reheat them in the oven at 200C (400F) mark 6 for 10 - 12 minutes or until piping hot. Complete the recipe from step 5. An exotic winter warmer, this tagine is a fabulous twist for festive leftovers. Want to make the most of the bread you buy and enjoy every slice? Our tips will save you money and help bring an end to bread being the most wasted food in the UK.